My next in-depth analysis will attempt to map out in detail what I expect to follow over the next few years as QE continues to give way to QQE, to get this on completion in your email in box ensure you remain subscribed to my always free newsletter. In the meantime try to immunise yourself against the worthless deflation mantra in the mainstream press, because at the moment we are experiencing the calm before the coming inflation storm. Thanks for your articles, great stuff as always. I'm in my late 20's and have put together a shares portfolio which is now 2.5x my after tax salary. Assuming just compound dividends and average dividend growth this should be enough to support me fully in 15 years (i live fairly frugally). However the point you may not like is that I purchased some BTL property in 2010/11 which is 60% mortgage - now on SVR about 4.8%. I bought these small properties to potentially help me pay down my mortgage quicker since the properties have monthly cash-flow (cash-flow would cancel out if rates went to 10%). As well as this I have my own house which is 50% mortgage. My wife recently had a baby (which adds some weight to my shoulders) and doesn't want to go back to work so i wont be adding to my investments at the speed I could before. If property/rents don't increase in value I should be paid of in 15 years. From your previous posts I have started to take your advice by storing additional amounts of long life foods and have an area in the garden to grow food if required. However my question is how could I reduce my risk, as I'm sure there are lots of people out there with mortgage debt, how can we reduce the pain if the worst comes. Should I look to gold, how do I know how much to buy in multiples of my debt? thank You for the interesting perspective Yr article gives.. I do not understand however how the government will cancel its debt to the private Bank of England. Of course both the government and the Bank can transact without the knowledge of the public but the debt will remain. And this is as You say the big issue. The debt of the people increases while the people cannot do anything abt it. I do not think The Bank will cancel that debt in any way. Pls comment.The creation of inflationary money is of course the only outcome for the politicians so inflation will come.The inflationary money goes to the banks and to the government only. So that will already delay its effect and make sure they are the only winners from the creation of that money.My question is when do You think the inflation will really start to accelerate? I'm sure many readers will be keen to hear Your opinion. Just to clarify, I am saying that the government is effectively cancelling debt as it no longer pays interest on it, i.e. it is paying itself interest onthe QE bought bonds. So officially the debt still exists but in reality it does not, smoke and mirrors. 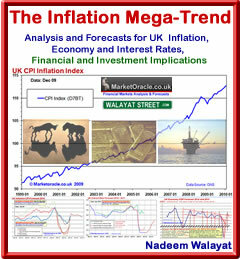 I will do a detailed inflation forecast over the coming weeks. Invididual risk profiles change according to age and circumstances, currently I am oober cautious, zero debt, well zero interest rate debt that is 100% covered by cash. Looking at your breakdown it looks to me like your investing in stocks with borrowed money, which is always high risk no matter what ones age is. If it were me, bearing in mind I am risk averse, I would reduce the size of the mortgages via some liquidation of the stocks portfolio. In my opinion, debt greater than X3 salary risky. So perhaps your goal should be to reduce total debt to under X3 salary. And gold won't help because again you would be buying gold with borrowed money effectivelty on leverage. I know it's hard to give individual advice as you said, instances change etc. However I would really appreciate your casual advice, of course I will do my own research. Blt property 300 k with180k mortgage, cash flow 400 a month posative. I think going forward I can save 10k a year, should I just repay the mortgage or buy some gold? As a guideline if we have inflation/hyperinflation will gold help me pay down my mortgage quicker? The reason why your stocks portfolio is borrowed money is because you have a £270k mortgage, so effectively £73k is financed against your property, if it were not then your mortgage would be £203k. This is how I would work out the risk. Firstly your total debt is 6.4X your income, however your own propery is 3.85X salary. Thirdly you have an annual £10k surplus or about 3% of mortgage. my goal would be to get the home mortgage debt to under £210k. I would cut my stocks portfolio in half to about £35k and use the £38k to reduce the mortgage to £232k, then I would use the annual £10k surplus to pay down the mortgage all the way to under £200k so for the next 3 years. Remember the name of the game is to cut risk not increasing it which is what buying gold and holding stocks does i.e. these are high risk investments. I always allow for the worse case scenerio of a 50% loss and the impact that would have on my finances. if it would give me sleepless nights then I reduce risk. P.S. hyperinflation is not a certainty it is a worst case scenerio, I currently put the actual risk of HP during the next 3 years at about 15%. 21 Jul 12, 01:58 The Quantum of Quantitative Easing Inflation is Coming! I would love your personal take on our situation. I am struggling with where to put our money - so as to preserve capital in the event of some financial armegeddon appearing. We are a family of 4. Wife doesn't work - I am 43 - make $300k a year. I have $1M - we rent our home - have no debt. $200k in a country south of the border- invested in a business that earns 18.5% annually - hold physical property as collateral. $100k miscellaneous - trading accounts, etc. Own equity in 6 start up companies - anywhere from 1% - 12%. All in the digital media space - in lieu of cash payments. 21 Jul 12, 01:59 Going Japanese? In your various articles on the Inflation Megatrend you haven't mentioned the Japanese experience but years before the West's financial crisis of 2008 Japan had its financial crisis with its big banks effectively bankrupt.The Japanese authorities responded with a combination of ZIRP and QE.Unfortunately it didn't work and asset deflation continually reasserted itself despite QE injections.Since the peak of the Japanese stockmarket in 1989 it has,to date,lost around 75% of its value despite repeated doses of QE over the years. Interestingly when the West had its financial crisis in 2008 they responded in exactly the same way as Japan with a combination of ZIRP and QE.Will the West go the way of Japan? Given all the QE injections by Japan over the years why do you think the Nikkei has been such a poor performer?After all if one follows your theory that excess money printing(QE) is bullish for stockmarkets,the Nikkei should have gone up like a rocket but instead went down like a stick. Over the last 10 years the Nikkei 225 Index was the worst performing with a return of-21% ranking Japan 23 out of 23 stockmarket indices. 21 Jul 12, 02:00 Got Something! I think you have got something, Nadeem. I really love your newletters. IMO you are a voice crying out in the wilderness. Keep up the good work!!!!!!! Even before the hyper part of inflation actually begins, the banks will jack-up their interest rates to protect themselves (I'm talking 20, 30, 40+ here). In the unfortunate (or fortunate?) circumstances of your bank going bust, the government will step in, bail them out, tear-up contract law, and jack-up the interest rates anyway. So in either case you are shafted. Do you thin you will still have a job in that scenario? Unless you are a banker or politician, then I doubt it. Say goodbye to your home and your current life. In terms of gold, I don't see how you can go wrong in such extreme situtations. As long as it's in your possession (not in a bankrupt bank, when they close their doors) then you can get whatever you need to survive - cash, food, items, even a home etc. Google Exeter's pyramid to see the chart outlining the most liquid assets (gold and silver is at the bottom of the pyramid). 2) A rock-solid brokerage account with a cast-iron balance sheet. 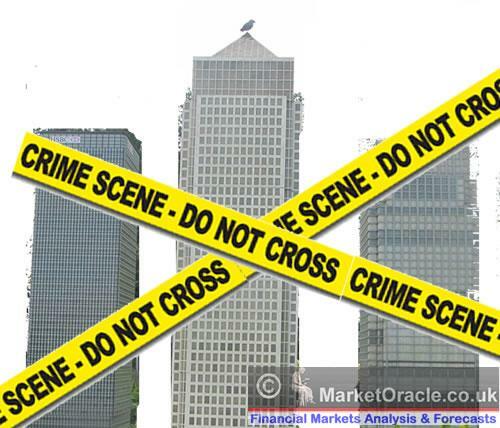 When banks fail, then so does your brokerage account and your stocks with it (see MF Global). Stock are just another piece of paper unless your have proof that you own them. Just my humble opinion. Do your own due dilligence. You talk of wage inflation but if we get it will the BoE have to raise interest rates? I have cash but no job or house. I would buy shares but am expecting markets to fall. Wage inflation without interest rate rises would be very bad for me. Do you think the Eurozone will hold together? I look at property over there and it is dirt cheap compared to the UK. If I bought there instead of the UK it would leave me with extra capital to invest. However if the Eurozone falls apart then surely property would be worth less.... initially... until they start booming after escaping the debt burdens and devaluing. That's when the UK looks like a real basket case? Your portfolio looks great, cos I don't know enough about US property to comment on that element. However, I would have a greater weight in Oil and other commodities than Gold and Silver, 20% seems pretty high, I currently have about 2% in gold and silver, though I am tempted to take a detailed look at gold and silver. So if it were me, I would drop Gold and silver to $50k and switch $150k in other commodities, with the remaining $50k in say big cap dividend stocks. 21 Jul 12, 10:24 Japan is different. The differences between the West and Japan and numerous, and I have touched on many over the years. It really is a case of the sum of the whole rather than individual reasons. For instance Japan had the mother of all bubbles, when Tokyo was worth more than the entire United States! In my opinion Japan has not had deflation, we can see this in rising per capita GDP. What Japan has had is a FALLING population, which is ONE of the primary reasons why asset prices are falling. Offcourse asset destruction tsnumai style can impact on this trend. ANother point is that Japan has high savings (does it still?) and a trade surplus, so the fiat currency dynamics are different. There are many, many other reasosn such as th uniformity of the population and they way they react and behave is different to the individual (GREED) focused nature of most westerners. Therefore it is a HUGE mistake to think that what happened in Japan is going to happen in the West. A HUGE red herring just as debt deleveraging deflation has been when we have had INFLATION of 15% in the UK these past 4 years. My conclusion as of at least Dec 2011, is that the Euro-zone will break up. Given amount of Qe to date the Bank of England effectivelty now does nto need to raise interest rates to reduce future wage price inflation, because all it would do is to unwind some of the QE which would have the same effect as raising interest rates. Could you please provide a quick take on pound versus dollar over the next few weeks/months??? My existing conclusion as of several months ago as of about £/$ 1.60 is that it should fall against the Dollar, I have a target of £/$ 1.45 pencilled in, which is making me more inclined to hold on to dollars than I had been earlier in the year. Hi Nadeem - well I've enormously enjoyed reading you over the years, but I'm afraid I'm still a dummy....so...why can the debt bought by the BoE not just be retired? I assume they'd have injected dosh into the system by buying, so why would they pay the govt. any interest on retired debt? Where am I going wrong please? Retiring the debt would shatter the illusion that fiat currency has value. At the moment the markets assume debt will be repaid, retiring the debt would flash the message of infinite money printing because that is what they would be doing, i.e. printing money without any consquences so no one would want to buy or hold it. Remeber Government Bonds are a scam, so as to allow people today to pay LESS taxes for the servies they enjoy. The banks are party to this scam. The scam manifests it's consquences in the Inflation Mega-trend which is why we will never have a deflationary trend. Also remember that governmenbt bonds are fiat currency, so eventually and rather quickly no one would want to hang on to sterling and so we would have hyperinflation. In Summary Retiring the QE Debt would result in very high inflation if not hyperinflation because there is no free lunch. YOU cannot just print money/debt then pretend that it no longer exists. What do you make of natural gas and gold prices at the moment? Historically, when the subject of the time is quantum QE, does not gold represent that best currency/investment? superior benefit in holding gold then any paper debt. I would, in heart beat, take any bond that yields 10 to 15% like we saw in the 70-80. Today, hum, not much? Your analysis and emotional stand on the subject are much appreciated. According to Wikipedia: The Japanese government tried to print its way out of trouble but because the aging population starting saving deflation ensued. Have we in the west not got an aging population? Japan is part of the West, a small but significant part, that is more competitive than most other western nations, so it has a comparitive advantage. The UK and US are NOT Japan, their populations are NOT shrinking and there are at significant compettive disadvanatge to Japan over a number of measures. Bottomline you cannot compare one country to another, even comparing UK to US does not work. Gold is a commodity, nothing more. You hear me write a lot about Deflationists being delusional for decades, but so are Gold bugs because it will NEVER become money again, okay I mean in terms of our current civilisation continuing. Therefore I treat gold investing as speculative, high risk, in fact I see exposure to oil as far lower risk via large cap oil stocks. You do a great job in a lot of areas but you dont understand the gold market. Gold is being used as money in transactions (oil for gold etc), in backing loans (EU) and is being talked about as a Tier 1 assett. It is moving back into the monetary system because fiat money is being created and paper assetts are as risky or more risky than gold. The two most populous contries in the world know golds place (China and India), in addition to other countries (Russia) and people. Only the West believes in paper assetts at this point. There is a difference between "gold bugs" as you say and people who know the fiat money system is dying. What will occur is speculation but the current fiats are done. The govts will want to institute another unbacked fiat. The question is will it work. Will it restore confidence in paper money. Many wont use it. The reserve currency will be up for grabs in the future and gold will be one of the competing currencies. Paper is the speculative assett at this point. A Gold standard is never going to happen because it would prevent governments from printing money to buy votes. China, India - ALL print money, gold is just a side show, it drives nothing. Yes, when current fiat money dies, then it will just be replaced by another fiat currency, that is the lesson from history. Gold will never be a competing currency, never mind a reserve currency. Whilst it is a good hedge against fiat currency money printing, however uf you put all your eggs into Gold, then you willget badly burned just as occurs with every speculative asset, so you need to know when to exit the trade. Don't forget what happened in 1980 when gold collapsed into a 20 year bear market, to imagine it can't happen again is a huge mistake. You accumulate assets when they are hated and distribute them when they are loved by all, thats how you grow your wealth, not by becoming e motionally attached to any market. Nadeem, I agree with what you wrote but I think we are talking about two separate things. Gold has, is and will always be used as money. A gold standard is a different thing and govts do not want that and will only go to backed money as a last resort. During hyperinflations people move from fiats to other types of "currency". In Zimbabwe they use the US dollar and gold. I think there will be a bubbble in gold and you will have to get out at the right time and then into the next undervalued assett as you said. every assett has its day. Keep up the good work ! I was interested to read your comments about QQE damaging Sterling. I have lived abroad for 13 years now and my wife and I want to return to UK. The rate of exchange GBP to AUD makes a big difference to our future wealth. I wondered what thoughts you had on the future of Sterling strength and to what timeframe. If GBP is to fall (especially versus AUD) timing is all important! thanks for another great post, I did have a question though.. So how is QQE more inflationary than QE? To my mind, QE - through what is known as seigniorage - gives the govt nearly unlimited fiat currency to spend. If the key to unlimited spending is having no interest to pay, then BoE buying the bonds from the private sector provides just that. Now, if QQE would bypass the banks/private sector but do essentially the same - accumulate govt debt on BoE's books while collecting no interest - then how is this more inflationary i.e. resulting in still more unchecked spending, than QE? If QQE implies official cancellation of debt then Andrey's question still stands..